Turtles of Sleepy Hollow Lake - 04 - It Feels So Good! (Turtles of Sleepy Hollow Lake - 04) We could see the expression of pleasure of this basking turtle, as if he or she were saying "It feels so good!" 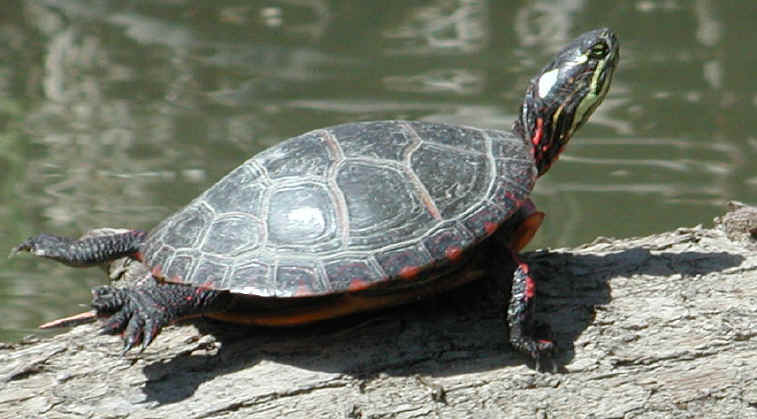 We watched silently from our canoe at the outstretched and uplifted head and the way he or she rested upon his or her plastron (lower shell) with extended rear legs reaching for the sun. From the markings on the shell this appears to be a Map Turtle. Let us all resolve to enjoy the wildlife around us without harming it.